camera controls, which don’t work at all right now. changing settings and testing all game textures which should have different compression options for iOS. testing and optimizing performance for all scenes and all gameplay elements (this will take the most time and may require remaking various game scripts and scenes). I hope to get all of this done and prepare the game for publishing on App Store within one-two months, unless I encounter some issues. I’ll keep posting updates about progress with iOS version on this website and Youtube/Twitter channels whenever I have something to report. As to Android version, it may require a lot more time due to abundance of various devices from different vendors, each coming with its own modification of Android OS, so there are no set schedules for it for the time being. 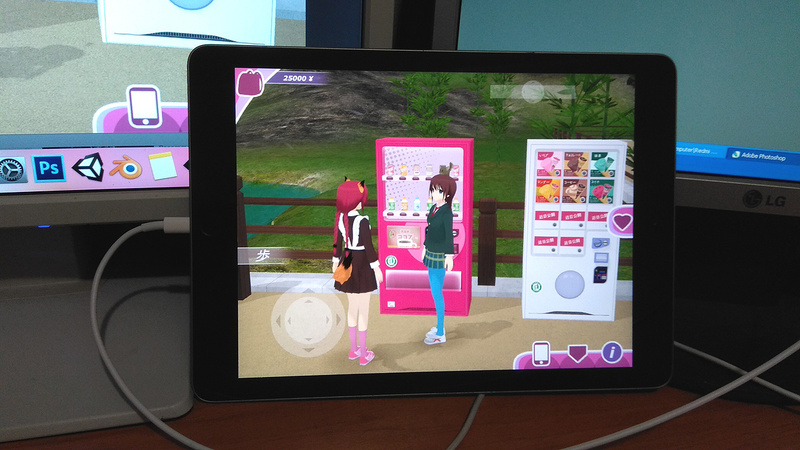 BTW, the iPad you can see on the photo above was bought two days ago with money I got from App Store thanks to people who decided to support the future development of this project and bought “Master Key” in the 2D version of the game. Every single cent I get from App Store/Google Play (and, since this year, Steam) will be a direct investment into the future of Shoujo City. This project has made a huge progress already since 2015, and it will keep evolving and getting better – as long as there are people who like and want to support it. Thank you. Thus far everything is making good progress and I think it’s a realistic goal to have all planned game features finished by 2020. I like what you think, because I use ios, but I can not help you because I do not write scripts, but I can do something for you and I can introduce you to something like try to hire a voice engineer or something else. Thank you, but I can’t really afford to hire anybody at this point. If you happen to know fluently any language apart from English, you can help by translating game texts. All translations are done by volunteers, so completion status of all languages depends solely on whether there are people willing to translate those texts. It’s coming this year, but I don’t know any dates as yet. 3D version will be released for Android later this year. Android version is coming later this year.